I have never wanted to find a lady bug as much as I do right now! My miniature pepper plant has aphids...INSIDE the house! Ugh! To make matters worse, as soon as it starts to warm up outside a bazillion ladybugs will suddenly appear inside my house as if they materialized from thin air. It's like magic...and I would do just about anything to see a few like, NOW! I guess it's my own fault. For some reason the aphids had gotten onto my container plants on the patio during summer. I controlled them pretty well but they did keep coming back. They were mostly on the Chamomile, but I was growing some ornamental peppers nearby. I never saw them on the peppers though. When fall got too cold and I brought some plants inside, I checked carefully for any bugs or foliage damage. I saw none, so I brought them inside and they took up residence in my living room windows. Then the horrible day came (3 months later) when I noticed the aphids on the house plants. I noticed them on the pepper plants first. They were also on the pansy next to them so I made the decision to sacrifice both plants for the health of the rest and outside they went. They were the only 2 plants in that window but I checked the other plants anyway and they were all clear. Flash forward a few weeks and I see the little sap suckers again! Really? So, since I had cleared out all the visible aphids how did they appear halfway across the room weeks later? Aphids are wingless and aren't really known for their crawling speed, so that didn't explain it. I kept researching and then I found out something particularly gross. Did you know that aphid eggs are airborne? We breath that air! Double yuck! I bring the plants inside to improve the quality of the air and instead get a nose full of bug eggs. Eww! Ok, childish reactions aside what do I do now? Well, I'm not going to throw these plants out because obviously I'll just find them on more so I might as well save these. I can't count on the ladybugs making an appearance any time soon (they wait for a really warm day before they magically appear, and it's snowing right now!) so what do I do now? First, I take the plant and hold it sideways over the sink. I blast each leaf with room temperature water using the dish washing attachment. 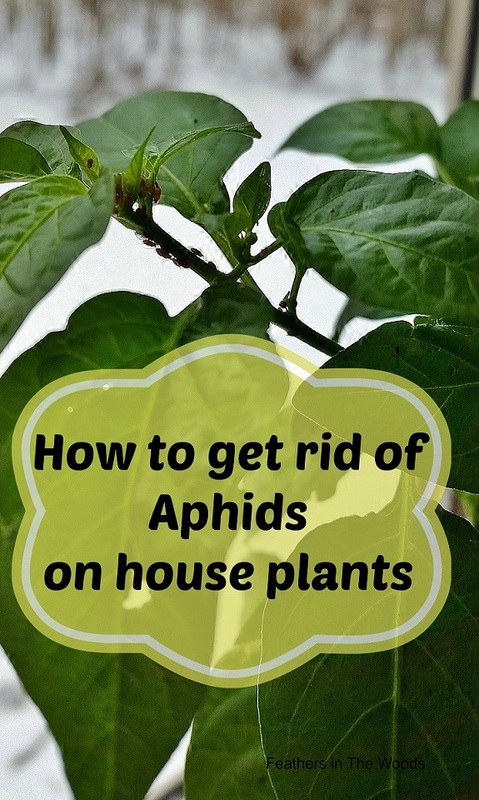 Then I set the plant upright and run my fingers over everywhere I see or saw the aphids. After I've rubbed down the whole plant, I turn on its side and rinse again. Let it dry. Then I take a q-tip and dip it in rubbing alcohol and dab any remaining aphids with it. They like the new growth and sometimes they are burrowed down into small areas and the water can't hit them strong enough to dislodge them. The alcohol works but be sure to dab it on the insects. If you get a little on the leaves its ok, but never spray the plant with alcohol that will damage it. You can use an insecticidal soap if you have one. I like this one: Earth Tone Insecticidal Soap. Just follow the directions on the bottle. I usually skip the soap if I'm working on herbs that I grow indoors, since we'll be eating those. Many gardeners use Neem Oil to control aphids. It works great too and both of these are organic which is important when using it in a enclosed area like inside your house. I could go out and grab my bottle of Earth Tone, but since all my gardening stuff is locked up in the shed and there is a ton of snow and cold air separating me from it.....I will be using what I have in the house! Whatever method you use, it will probably have to be repeated a few times. As those nasty airborne eggs hatch the new bugs will need treated. Treat them while they're young and after a few weeks you should be completely pest free! Or just call the ladybugs over, they'd be happy to have a free snack. I hate finding those in the house.. thank you for sharing a solution. Me too! I got really freaked out when I found out their eggs are airborne. Yuck! Yuck! Hate it when those critters attack! Thanks for the tips! And thanks for sharing with SYC. See you next week at SYC! Thanks for featuring my post! I am so very flattered!